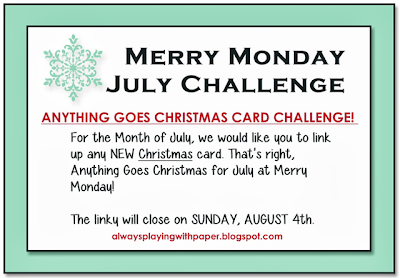 We are now on week 3 of the July Challenge at Merry Monday! 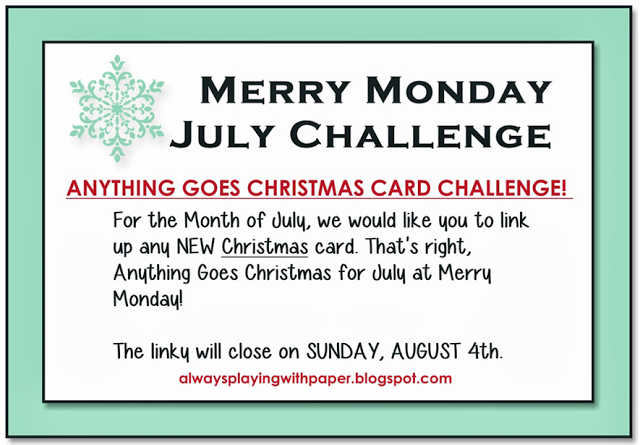 The challenge in July runs all month long and you can enter any new Christmas creation! My card this week is a retake on last week's card. I went with a toned down version of purple, Smokey Plum. It has more of an actual purple tone than my photography skills allow to show! All of my images are stamped in Smokey Plum pigment ink and clear embossed. My background paper is hand stamped. I went back and added Glitz gel to the center of my snowflakes for a little bling. I'm loving these purples, Allisa! This scene is gorgeous and the snowflake background so pretty! Beautiful card Allisa, your bow is stunning. Stunning card. I love the design and the colors. I always finish the inside of my cards, so I really liked seeing that you did that on yours also. It just "complete" the card/design. Thanks for sharing it with us this week at Christmas Card Challenges. Hope to see more of your creations in the future. Wow, this card is gorgeous in plum colours. Absolutely gorgeous. I love the color. Very pretty!! Thanks for playing in our "Monochromatic" Challenge #71! Very nice, I really like the layout of the card mats that you used. Looking forward to seeing you play again with CMM In the future..